Not Sure What to Post on Social Media? 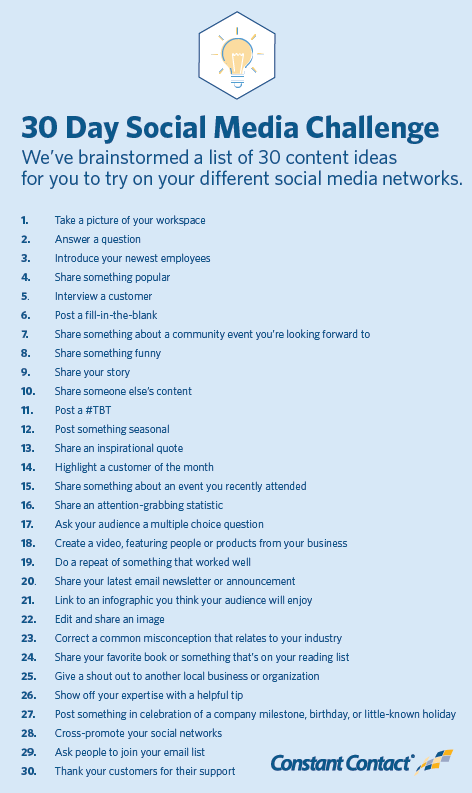 Try This Social Media Challenge! What’s the hardest part of using social media for your business or organization? If you’re like most small business owners, coming up with content is at the top of your list. Whether it’s finding the time to create content, or just figuring out what to post on social media on a day-to-day basis — it’s easy to let coming up with content ideas slow you down. 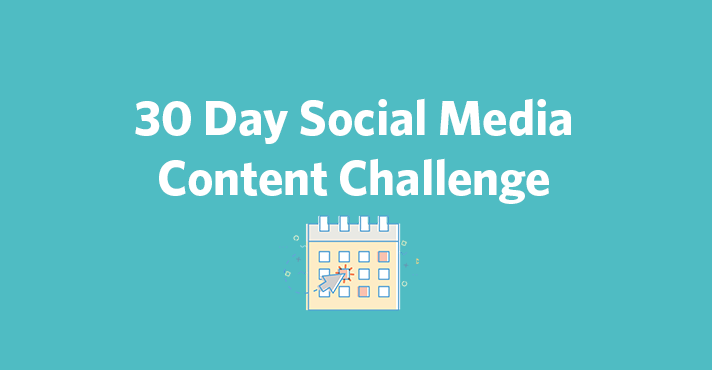 Knowing how hard it can be to come up with content to fill the seemingly never-ending social media feeds, our marketing experts at Constant Contact have brainstormed a list of 30 content ideas for you to try on your different social media platforms. And don’t worry or be intimidated. Most of these can be completed in a matter of minutes. We’ve also included helpful examples from other successful small businesses and organizations to get your creative juices flowing! Looking to streamline your social ever further? Check out our recent webinar on how to develop a super simple social recipe! You can try all 30 or pick and choose from the list. If you find one type of content you really like, don’t be afraid to try it twice. As you get started, pay attention to what works well and what your audience engages with the most. The more you know about your audience, the easier it will be to create great content! Giving people a look behind the scenes allows them to get to know your business and build the trust you need to turn them into a customer. If you haven’t heard @davecharest speak you’re missing out! And if you’re in #ATX today you’ve got the chance to learn all about how #emailmarketing can grow your business. Swing by the Palmer Events Center for the #SmallBizExpo to listen! Tip: Instagram is a great tool for editing photos on your phone and posting them easily to your different social media channels, like Facebook or Twitter. You’re answering questions from customers every single day. Chances are a lot of the people who follow your updates on sites like Facebook and Twitter will have the same questions! Pick one question and answer it today. People love to see the people who make your business or organization great. Use social media to introduce new employees and make a more human connection. If something is popular at your store or on your website, chances are it will be popular on social media too. Look to highlight your most popular assets on your different social networks. And, if they are really popular, consider boosting them with Facebook and Instagram advertising. Tip: Even if you’ve posted a link before, there’s a good chance a lot of people missed it the first time. This is especially true on a high volume site like Twitter. You can link to popular blog posts or webpage multiple times to drive traffic to your website. People do business with people that they know, like, and trust. One of the best ways to build that trust is to show real people using or talking about your products or services. Our #givemealsgivehope campaign will help single moms like Eileen. “The help I get here means everything. It means I can provide for my kids. I don’t feel like I’m letting them down.” #endhungerhere #hunger #moms #singlemoms Thanks to Stop & Shop and @citizensbank for supporting #GiveMealsGiveHope! Remember fill in the blank questions from when you were taking tests back in school? Those types of questions are a lot more fun on social media. This is a great way to encourage customers to engage with you and share their ideas. One thing to be on the watch for, however, is ‘engagement-baiting.’ In recent years, Facebook and other platforms have cracked down on some types of posts like this. Entertainment is a big part of why people go on social media in the first place. Look for opportunities to have fun with fans and followers — just be sure to stay true to your brand. Every business and organization has a story — some longer than others. Look for opportunities to share pieces of that story and let people know why you do what you do. Here’s some good news: You do not have to create every piece of content from scratch. In fact, sharing other people’s content is a great way to build relationships for your business and can also help position you as a source of helpful information. “Throwback Thursday” is a trend on social media where users share an older image on Thursdays as a look back to an earlier time. You can post an image on any social network and add the hashtag #TBT. Throwback Thursdays are especially popular on Instagram and are a great way to make a personal connection with your followers. Adjust your social media posting schedule to reflect the changing seasons. If it’s a hot summer day, offer a way to cool off. If you’re looking forward to the fall, give some advice for heading back to school. This is a great way to make a more personal connection with your fans and followers, even if you’re still talking about your products. What inspires you? It could be a picture of your team, an article you read online, or just a quote that you think your audience would connect with. If you’re a nonprofit, sharing inspiration could be something simple like an update on your progress for the year or a milestone worth celebrating. Don’t just show your customers talking about you; talk about your customers! Once a month, pick one special customer or supporter and celebrate them. If they are a fan or a follower, you can easily tag them and they will receive a notification that you’re featuring them! Hopefully you have time to get out of your store or office occasionally and attend an event. Did you take notes or snap any pictures? Have you seen any articles or blog posts about the event that you think your audience would be interested in? Share it and let people see what you’ve been up to. Tip: Even if it isn’t an event directly related to your business, sharing something about a local event can be a great way to connect with your community. Pay attention to what worked well at that event and think about how your business or organization could host something successful as well. Have you read an interesting statistic or new study that relates to your industry? Share it! Stats catch people’s attention and are a great form of shareable content. Let fans offer their input with a multiple choice question. This is a great way to boost engagement and also gives your audience the chance to share their ideas. Twitter and Facebook even offer poll features you can utilize. Tip: You can use multiple choice questions a lot of different ways. Ask fans for feedback about what service qualities are most important to them, what their favorite product is, or even something fun like which award show performance they most enjoyed! Creating and sharing videos has never been easier, thanks to social media. With a smartphone, you can snap a quick video and automatically share it on Facebook, Instagram, Twitter, LinkedIn and more. Use Instagram’s video feature to create a shareable video from your store or office. Or try Facebook Live to livestream video from wherever you are. Facebook gives you the option to share the video to your page, where fans can find it long after the livestream ends. Take a look at some of the content you’ve shared in the past. Was there a particular Facebook post that generated a bunch of shares, or a photo on Instagram that saw a ton of comments? Each platform offers insights and analytics sections that you should be frequent to garner information about your audience. Don’t reinvent the wheel. Look to create something similar and try sharing it again. When it comes to #socialmedia marketing, it’s now very much a pay-to-play world. Does your business send email newsletters or announcements on a regular basis? If so, you’ve already done the work to create great content. Share your latest email on social media and show fans and followers what they’re missing out on. These days, you can find an infographic about anything. Don’t believe me? Log on to Twitter and search for your industry and the word infographic (Example: restaurant infographic). Chances are you’ll see a ton of infographics related yo your industry. Share one you think your audience will enjoy — just be sure to cite the original source. You can make an image stand out by editing it online. Facebook and Instagram have built-in editing features. Or try tools like PicMonkey, Canva, or Adobe Spark to edit images by adding text, filters, or overlays in a matter of minutes. You can also add new designs to images or resize them to fit the dimensions of each social network. Education is a powerful tool for building relationships online. Try to teach your audience something they didn’t know, or even misunderstood, about your industry. This is an easy way to share your expertise and hopefully spark a conversation with fans and followers. Have you read or listened to something good lately? Talk about it on social media. This is a great way to connect with fans and followers beyond talking about the products you sell or the services you offer. Tip: Consider creating a reading list or Spotify playlist you think your audience would enjoy. These lists are easy to create and you can always ask your staff and customers to add to the list! Picking up lunch at a local restaurant? Snap a picture and share it with your audience. Are you following other local organizations on Facebook or Twitter? Share one of their posts and show some support. Chances are you know a ton of tips and tricks your audience would love. Write down a list of helpful tips related to a particular product or service you provide. You may even have tips from customers. Share them and make sure to mention the customer in your post. There’s a reason why the people who like your Facebook page are called fans. These people really do care about your success and want to be there to celebrate it. Let them in on the celebration by talking about it on your different social networks. Tip: Who doesn’t love a celebration? Invite your customers to celebrate with you by creating a special offer for them to take advantage of. Have you gotten started on a new social network lately? Sharing content across your social networks is a great way to bring your social media audiences together. Tip: If you’re on Pinterest, you can easily share a link to a board on other social networks like Facebook or Twitter. This is a great way to promote multiple pieces of content at once. Posting to social media is a great way to keep people up-to-date and build an online community. If you want to reach your audience even more effectively, encourage them to join your mailing list. Be clear about what and how often you send, so they know what they’re signing up for. Here’s an easy one — say thanks! It’s never a bad idea to let your customers know how much they mean to you. Tell them what they mean to you and they’ll show you the same with their continued business. There you have it: 30 ideas, 30 ways to reach your audience and build your online community. If you commit to making it all the way through, you’ll have a lot of information about what your audience likes. You’ll also be able to see how much you can accomplish in just a few minutes a day. Looking for more marketing tips? Sign up for our newsletter! Our Hints & Tips newsletter delivers our best marketing resources straight to your inbox — twice each month.